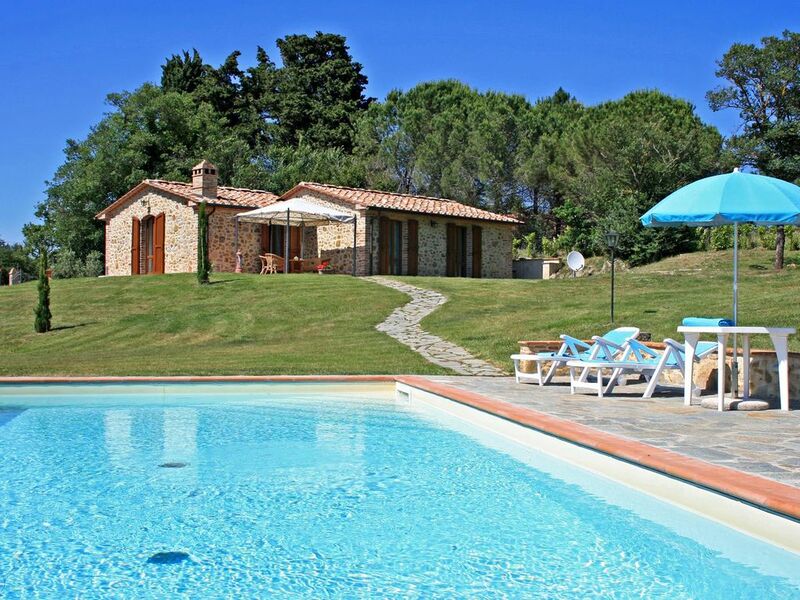 In the picturesque setting of the 'Metallifere' hills, west from Siena, is found this characteristic stone built house, completely independent and surrounded by an extensive garden with private pool. The cottage is in a peaceful, panoramic position surrounded by gentle rolling hills, which in the springtime are covered by a colourful carpet of flowers, enhancing the already magnificent panorama. This typical Tuscan country house features internally wood beams and terracotta floors, is furnished in the traditional local rustic style and provided with all modern comforts. The rooms, all provided with window doors onto the garden, are cosy and luminous. The hills stretch out as far as the Tuscan coast, discovering along their way, the sunflower fields, vineyards and olive groves, so typical of the area. In the extensive private garden, the ideal place to eat outside and relax, guests have at their disposition an inviting 12 x 6 m- 1'40 m depth private pool available from May to October. The property is fully fenced and provided with automatic gate. Ground floor: living/dining room with fireplace, corner kitchen , 1 double bedroom, 1 twin bedroom both with window doors onto the garden , 1 bathroom with shower; two furnished terraces. sea level, lies approx. 900 m away, is easy reachable on foot, and offers a grocery shop, a bar-restaurant anda post office. The nearest larger village with more facilities including bank, tennis court, etc. is Radicondoli at approx. 5 km. Other distances: San Gimignano 40 km, Volterra 43 km, Siena 45 km, the Tuscan coast with the sandy beaches of Follonica 50 km, Florence 75 km, Pisa km 110. Beautiful retreat with the essence of Tuscany at your doorstep. This lovely cottage is remote enough to feel you are enveloped in the Tuscan hills, but the beautiful village of Belforte is just a stones throw away by car. The property is well cared for and the owner was very friendly and welcoming without being intrusive in any way. His English was excellent and he very clearly loves, and is knowledgable about his local area. Our two boys (10 and 12) especially loved the pool. We visited the local restaurant in Belforte both to eat in and for takeaway pizzas. The food was pleasant enough and the views were beautiful. Very happy to know that you have spent a pleasant holiday in one of the most genuine areas of Tuscany! Wenn Sie eine Unterkunft suchen, die Erholung pur verspricht, sind Sie hier richtig. Wir haben zu viert (zwei Kinder) eine wundervolle Zeit verbracht, die Betreuung war sehr freundlich, das Haus sehr sauber und gemütlich, der Pool genial, die Aussicht top - und man ist dabei völlig ungestört mitten in der Natur (inklusive quakender Frösche in der Nacht) und kann seine absolute Privatsphäre genießen. Die einzigen - im Vergleich zum Gesamtangebot recht kleinen - Mankos (zumindest Anfang Juli 2011): Zwei, drei große Sonnenschirme würden Pool und Terrasse noch gemütlicher machen, und auch eine Außendusche statt nur eines Schlauchs könnte nicht schaden. In Summe absolut empfehlenswert und sein Geld wert! The region is located in the central, western part of the country, north of Rome and south of Genoa. It is bounded by the Apennine Mountains to the North and East, the Apuan Alps on the north west and by the Tyrrhenian Sea on the West. From the Etruscan to the Romans to the Renaissance, Tuscany is possibly the greatest repository of art in the world, from extraordinary paintings and sculpture to frescoes and architectural masterpieces. Tuscany: a row of cypress trees breaking the blue sky on a rolling hilltop. Olive groves and grapevines marching tidily down the side of a slope. Little medieval hill towns gazing down upon a country that has been carefully cultivated.Siena is one of the most popular destinations for travellers to Tuscany. Siena is home to the famous horse race, the Palio, held in Siena's unusual central square. Belforte, a picturesque mediaeval village situated on an extremely panoramic hill at 550 m over the sea level.